A solar storm is headed this way. 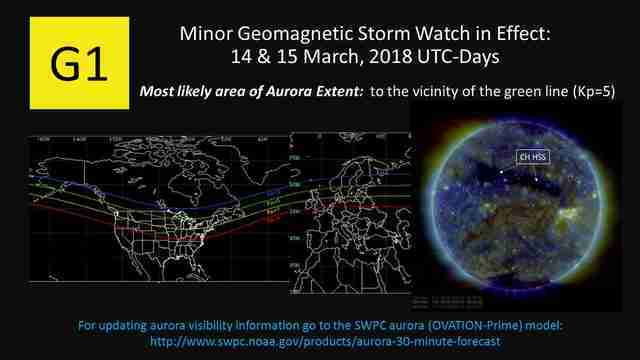 Some have blown the potential impacts of the storm out of proportion -- it is unlikely to cause "huge power outages" -- but there is one impact of the G1 geomagnetic storm that will be felt by many: a supercharged aurora the night of March 14. 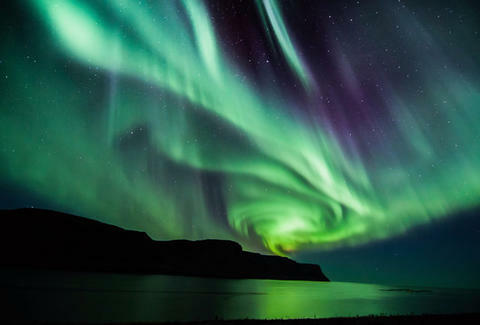 The burst of charged particles from the sun will give the northern lights a little kick. The radiant aurora borealis -- the northern lights -- may be strong enough that it will even be seen in the northern reaches of the continental US. In particular, the Space Weather Prediction Center (SPWC), a part of the National Oceanic and Atmospheric Administration (NOAA), projects the Lights may be seen in Montana, North Dakota, Minnesota, Wisconsin, Michigan, and Maine. The SWPC's chart below puts those states along the green line, which is the area most likely to see the aurora Wednesday night. States south of the green line may even catch a glimpse of the northern lights if they're a little more powerful than forecast. It's a great opportunity to glimpse the northern lights since they're likely to be appearing less frequently over the next handful of years. To make the most of that opportunity, you should get away from city lights and into a space with dark skies. Fortunately, there will be a waning crescent moon the night of March 14, which won't provide much interference for sky gazers. If you're interested in tracking the northern lights to find out when they might appear next, the SWPC's 30-minute forecast is a great tool, as is Aurorasaurus, which crowdsources aurora sightings.